I have absolutely loved baking and decorating cakes, especially in the past few years now that I know what I am doing. I seemed to have gotten so wrapped up with doing beautiful stacked wedding cakes, and over the top birthday cakes, that I forgot about the simplicity of cake decorating. This week I was able to take an order for a little girls 4th birthday. Nothing too crazy. Little mermaid theme. 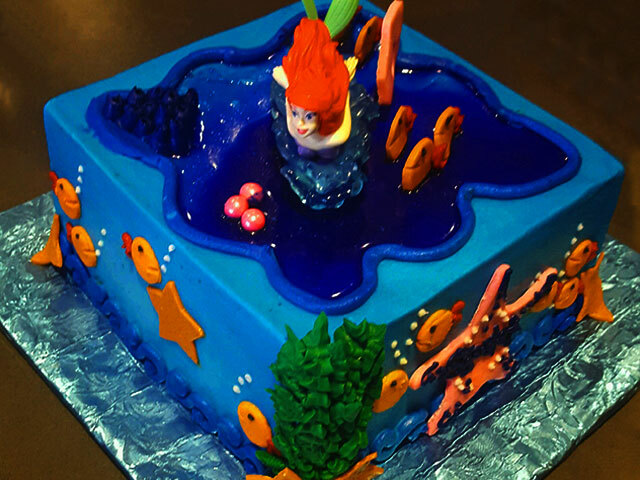 Single tier, 8″ square cake, with mostly buttercream, and a cute mermaid topper. I do like I usually do on my cake orders, tiered and filled the cake, frosted with a pretty blue American buttercream. Then the fun part, decorating. And for the first time in a long time, it was really fun! I made little buttercream fish with smiles. Cute chocolate starfish. The water on the top of the cake was dyed corn syrup. Candy pearls. Buttercream seaweed up the side. And a cute pink chocolate starfish right in the middle. My baby girl whose 2 looked at the cake and says “Super Cute. Hi Fishies.” And I couldn’t help but smile. This is why I started cake decorating. To do fun little fish, blowing bubbles. To see the look on that little girls face when she realized the cake was for her. I love making wedding cakes, and completing the dream of the brides perfect wedding, but sometimes it’s nice to get back to the basics. Enjoy the simplicity of the “Super Cute” of buttercream and all it can do. Sit back and say hi to the little fishy. I look forward to many more, but todays cake was somehow extra special. Laurie Leer is all about being creative. Her roots started in graphic design, but the artist really took over when she started baking and designing cakes. She started her company as a creative outlet to help facilitate her skills in graphic design. Not only did it make her design skills come to life, but the fun that came from cakes took over as a fully-fledged business. Over the past 10 years, she has delivered hundreds of cakes and become a go-to bakery for specialty cakes and flavors. 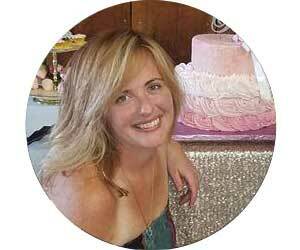 With 24+ reviews on yelp, and a large customer base, Sweet Kisses Cake Company is a well know resource for all occasion cakes in the Central Valley.